Seaside Book Nook: Lucky Me - A Must Read!! Lucky Me - A Must Read!! 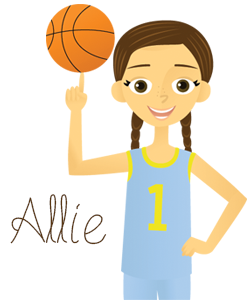 Synopsis (from Amazon): After breaking a chain letter, can superstitious Megan find a way to turn her luck around? Meghan McGlinchey is the most superstitious girl in her family—and probably in the entire state of Delaware. When she receives a chain letter from a stranger in Ireland, Meghan immediately passes it on, taking only a tiny shortcut in the directions. With the help of an eccentric cast of characters—and one very cute Irish boy—can Meghan figure out a way to stop her bad luck? Or is she cursed forever? One (or more) Sentence Summary: My Mom and I read Lucky Me together and I am not sure who liked in more; me or her. It doesn't really matter because we both LOVED it. I had never heard of a chain letter (of course my mom did), but I would love to start one now. My mom said she use to get them all the time as a kid. How cool is getting mail, right? Megan is absolutely hilarious, as are her sisters. The book is 100% funny. Favorite Character(s): Megan, Finn and Carissa were the best. I think Mrs. Buck was so funny. She would make an awesome grandmother! Setting: Mostly in Ireland traveling the country side trying to find the links to the chain letter. Ireland is one of my top 5 countries I would LOVE to go visit. It is in my Mom's top two! Fast read/slow read: I couldn't wait for my Mom to get home from work so we could read together for 20 minutes. We often went way past the 20 minutes, since we both loved the story. Cover: I just love Megan's shirt. I have one very similar. The cover is perfect for the story. Would I Read Other Books by the Author: My Mom has read Lost in London (click here for the review). 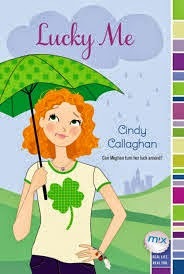 My Mom and I would both love to read more books by Cindy Callaghan. Cindy Callaghan grew up in New Jersey and attended college at the University of Southern California before earning her BA in English and French, and MBA from the University of Delaware (Megan in the book is from Delaware!). She is the author of three tween novels all published by Simon & Schuster, JUST ADD MAGIC (2010), LOST IN LONDON (2013) and LUCKY ME (2014). The ebook JUST ADD A FAMOUS TV CHEF is available for download from www.cindycallaghan.com. I have to share my two cents….Lucky Me is just too cute for words. It is perfect for 5th grade up. It is clean and a very funny story. Hard to find these days! It reminded me of Meg Cabot/Sophia Kinsella for kids. Absolutely adorable with so much humor! Well done Cindy, well done!